10 days from now, Athens, Georgia will fill up with fans curious to see what the 2019 version of the Georgia Bulldogs will look like. This G-Day game may not have the luster of the past two, which featured incumbent quarterbacks being pushed by marquee freshmen. Jake Fromm is the man, and that will not change until he decides he’s played his last game as a Bulldogs or runs out of eligibility. No, this year’s spring game, perhaps more so than any in Kirby Smart’s tenure, will be an opportunity for the Georgia faithful to get a sense of what they’ll be seeing on the field come fall. Obviously it’s a great chance to see the new crop of Bulldog freshman ready to take the field for the first time. There’s also a young group a receivers ready to shine following the departure of three of their leaders to the NFL Draft. 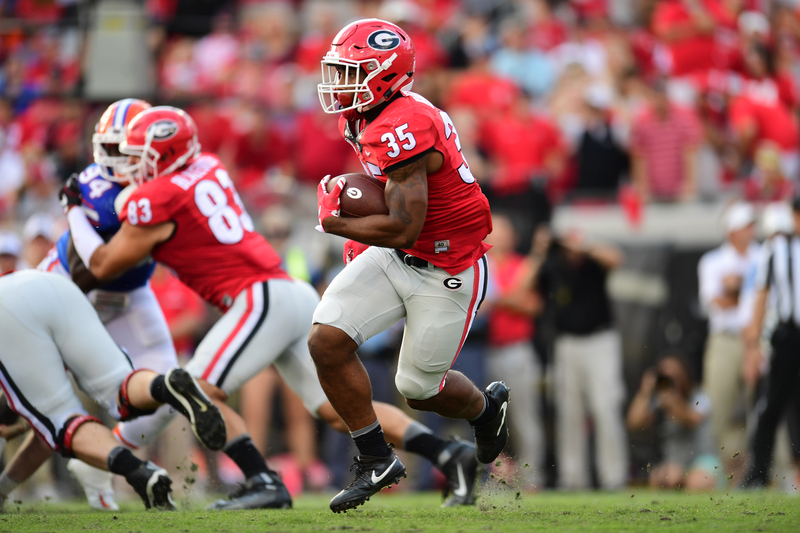 But the most important question mark, and perhaps the least talked about, is: who will back up Heisman candidate running back D’Andre Swift? It’s typically been a forgone conclusion for Georgia fans: Gurley and Marshall. Chubb and Michel. Swift and Holyfield, but this season seems different. All assumptions are that Swift will be in line for an increased workload in 2019. That would obviously lend credence to the Heisman talk, but it doesn’t fall in line with what Georgia does. Under Kirby Smart, only one back has seen more than 43% of the carries in a season (Nick Chubb: 44% in 2016). The Bulldogs will be searching for a clear backup for Swift. The fan’s choice would be Zamir White. The number one running back in the 2018 class, White missed the previous season with an injured knee, and doesn’t project to be back until fall camp. Then there’s James Cook, the speedy younger brother of NFL star Dalvin Cook. The younger Cook showed flashes of elite running back play, but he has been hampered by injuries as well. The backfield rotation has become so depleted that the coaching staff elected to move OLB Walter Grant to running back, for spring ball at least. Fans should get some idea of the pecking order during G-Day, and don’t be surprised if Brian Herrien emerges as the leader. The senior back from Douglasville, Georgia has paid his dues behind the Chubbs, Michels, and Holyfields, and seems poised for a breakout senior year, behind one of the nation’s best offensive lines. Way back in 2016, in Kirby Smart’s first game at Georgia, Herrien’s first touch as a Dawg went for a 19 yard touchdown against North Carolina, in the Chic Fil A Kickoff. In his time at Georgia, Herrien has carried the ball 174 times for 923 yards and 7 scores. He was clearly Georgia’s best offensive threat against Texas in the Sugar Bowl. Towards the beginning of last season, Herrien became Georgia’s go-to short yardage back, but actually finished the season with his fewest career touches (50). Herrien is a dynamic back. Scrappy, fast, and violent, he’s the perfect compliment to Swift. He has bought into the program and waited his turn. Will 2019 be the season he finally gets a shot at significant touches? G-Day should give us some answers.